We’d love your help. Let us know what’s wrong with this preview of Supernatural Tales by Vernon Lee. To ask other readers questions about Supernatural Tales, please sign up. 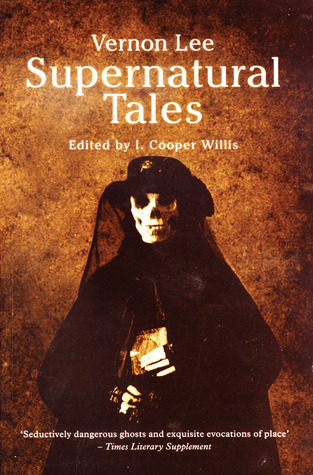 This collection of Gothic short stories was magnificent. Vernon Lee aka Violet Page is a wonderful and eerie writer. She has a knack for setting the scene. Her imagery is spot on. My favorite stories were 'A wedding Chest' and The Legend of Madame Krasinkas'. The former was heart-racing. The snippets of diary entries made for the perfect medium to tell the tale. My heart quickened as the story unfolded. I needed to know what was happening next. I loved the darkness of the events. I loved that th This collection of Gothic short stories was magnificent. Vernon Lee aka Violet Page is a wonderful and eerie writer. She has a knack for setting the scene. Her imagery is spot on. My favorite stories were 'A wedding Chest' and The Legend of Madame Krasinkas'. The former was heart-racing. The snippets of diary entries made for the perfect medium to tell the tale. My heart quickened as the story unfolded. I needed to know what was happening next. I loved the darkness of the events. I loved that the protagonist was driven by scholarly curiosity at first and by gut-wrenching need in the end. The latter was just too damn real. It was the perfect way of dealing with a sentiment we have all felt 'I don't feel like myself anymore, who am I?, what is happening to me?'. Brilliant! A lot of fun. Very gothic and baroque, with dense descriptions, the stories feel both of their time and out of time. Her love of Italy and art shine through all the stories - she was also known for her writing about aesthetics and her travels through Europe, especially Italy, and it is her knowledge in these areas that provides the density, the colour, the richness. Possibly the best of the stories for me were "A Wedding Chest" and "Amour Dure". The final story, "The Virgin of the Seven Daggers", A lot of fun. Very gothic and baroque, with dense descriptions, the stories feel both of their time and out of time. Her love of Italy and art shine through all the stories - she was also known for her writing about aesthetics and her travels through Europe, especially Italy, and it is her knowledge in these areas that provides the density, the colour, the richness. Possibly the best of the stories for me were "A Wedding Chest" and "Amour Dure". The final story, "The Virgin of the Seven Daggers", I found a little clumsy, as if it wasn't quite sure whether it wanted to be humorous or serious, and didn't quite maintain the style of the other stories. All the stories, however, have something to commend them -- riots of descriptive prose, for example, provide pools of interest. Of course, these stories are unlikely to shock or to scare a modern audience, but the best of them have the feel of fairy-tales, a kind of timeless quality. Not at all what I was hoping for, I only finished half of the tales. They were too drawn out and some had far too many characters for the length of the story/novella. I just did not appreciate these and they were not what I was longing for in a new Halloween read. Violet Paget, known by her pen name Vernon Lee, is remembered today primarily for her supernatural fiction and her work on aesthetics. An early follower of Walter Pater, she wrote over a dozen volumes of essays on art, music, and travel, poetry and contributed to The Yellow Book. An engaged feminist, she always dressed à la garçonne, and was a member of the Union of democratic control. Her liter Violet Paget, known by her pen name Vernon Lee, is remembered today primarily for her supernatural fiction and her work on aesthetics. An early follower of Walter Pater, she wrote over a dozen volumes of essays on art, music, and travel, poetry and contributed to The Yellow Book. An engaged feminist, she always dressed à la garçonne, and was a member of the Union of democratic control. Her literary works explored the themes of haunting and possession. The English writer and translator, Montague Summers described Vernon Lee as "the greatest [...] of modern exponents of the supernatural in fiction." She was responsible for introducing the concept of empathy (Einfühling) into the English language. Empathy was a key concept in Lee's psychological aesthetics which she developed on the basis of prior work by Theodor Lipps. Her response to aesthetics interpreted art as a mental and corporeal experience. This was a significant contribution to the philosophy of art which has been largely neglected. "The Lie of the Land", in the voume "Limbo, and other Essays", has been one of the most influential essays on landscaping.